Last week, I was given the great opportunity to have a chat with my aunt's good friend, Norm. Norm is seventy-five years young and was a dear for sharing his insight into the past with me, about his memories of the television first entering the everyday Torontonian home. As Norm states, before he was lucky enough to experience the new era of the television set, he and his family would listen to the radio. It was the source of entertainment through media-related information such as news and drama stories (with voice actors instead of the ones we see on our televisions today). 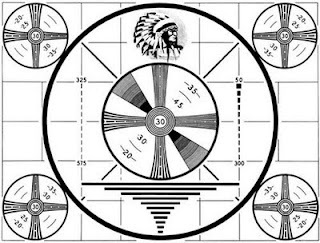 With the invention of the television, some of these programs attempted to make the switch over to the tube, but it was astronomically more expensive to produce a television show than a radio show due to the addition of expensive props to make the stories more believable. In the earlier days, it was common to watch television from store windows, where televisions were set up and tuned to popular programs. This is still depicted in some movies today. Norm first had a television in his home in the early-to-mid 1950's. He was not the first of his friends and neighbours to have a television, but not the last either. Before his parents gave in to the pressure and invested in a set of their own, Norm and his family would call upon the other households in their area to watch the set in their neighbours' homes. It was usually the better-off families who welcomed their neighbours into their homes to share in the magic of this new invention. Families of all ages crowded into one small parlour, with the small children lying on the floor. They were in charge of the volume control (a dial on the television set itself) and it was usually turned up to the loudest setting for everyone to hear. On the other end, esteemed members of the families (on a scale of age, of course) were allowed to sit on the furniture for a more comfortable experience. Television was certainly a family activity, a time when everyone got together to watch the evening show, very unlike what it has become these days. Norm's family's first television was a wooden, boxy affair. It had a very small screen, and of course everything was filmed for black and white programming in those times. Coat hangers were attached to the top of the set for better reception, which sometimes had to be adjusted depending on certain factors such as weather or maybe even how much static electricity the carpet was giving off! Don't try to zap your sibling after dragging your feet across the rug! Unfortunately, there was always that annoying black-and-white static snow, except that it was a lot more common in those days because the programming day ended promptly at midnight. After that, no more television until morning! Programming, as you can imagine, was a world apart from the kind of content we have now, and in many ways. There was also emergency broadcasting, especially during wartime, when times were more unsure than they are now. Doesn't this image seem cheery! 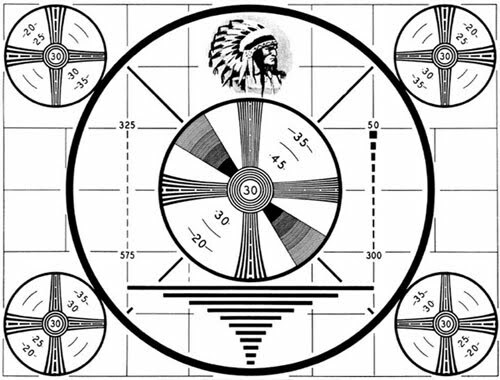 Norm said that when this image came on the television, it was also accompanied by a chorus of loud buzzing sounds. That'll certainly instill calm in a time of panic. I drifted away from television around 5 years ago. I don't miss it. I guess for me it just somehow died.